ApplicationWindow is a Window which makes it convenient to add a menu bar, header and footer item to the window. You can declare ApplicationWindow as the root item of your application, and run it by using QQmlApplicationEngine. In this way you can control the window's properties, appearance and layout from QML. Note: By default, an ApplicationWindow is not visible. Due to how Scope and Naming Resolution works in QML, it is possible to reference the id of the application root element anywhere in its child QML objects. Even though this approach is fine for many applications and use cases, for a generic QML component it may not be acceptable as it creates a dependency to the surrounding environment. ApplicationWindow provides a set of attached properties that can be used to access the window and its building blocks from places where no direct access to the window is available, without creating a dependency to a certain window id. A QML component that uses the ApplicationWindow attached properties works in any window regardless of its id. See also Customizing ApplicationWindow, Overlay, Page, and Container Controls. This property holds the control that currently has active focus, or null if there is no control with active focus. The difference between Window::activeFocusItem and ApplicationWindow::activeFocusControl is that the former may point to a building block of a control, whereas the latter points to the enclosing control. For example, when SpinBox has focus, activeFocusItem points to the editor and activeFocusControl to the SpinBox itself. This property holds the background item. The background item is stacked under the content item, but above the background color of the window. The background item is useful for images and gradients, for example, but the color property is preferable for solid colors, as it doesn't need to create an item. Note: If the background item has no explicit size specified, it automatically follows the control's size. In most cases, there is no need to specify width or height for a background item. See also Customizing ApplicationWindow, contentItem, header, and footer. This default property holds the list of all objects declared as children of the window. The data property allows you to freely mix visual children, resources and other windows in an ApplicationWindow. If you assign an Item to the contentData list, it becomes a child of the window's contentItem, so that it appears inside the window. The item's parent will be the window's contentItem. It should not generally be necessary to refer to the contentData property, as it is the default property for ApplicationWindow and thus all child items are automatically assigned to this property. This property holds the window content item. 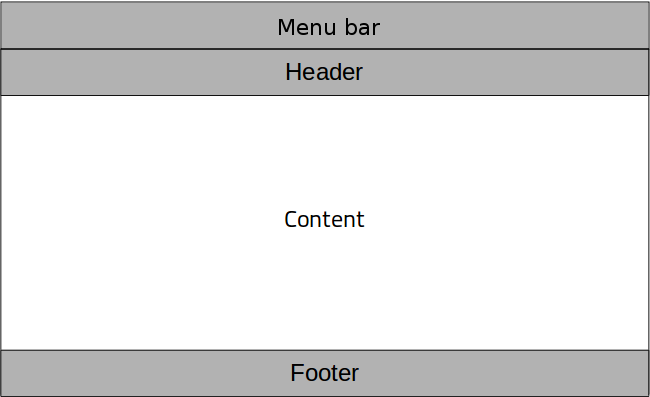 The content item is stacked above the background item, and under the menuBar, header, and footer items. See also background, menuBar, header, and footer. This property holds the font currently set for the window. The default font depends on the system environment. QGuiApplication maintains a system/theme font which serves as a default for all application windows. You can also set the default font for windows by passing a custom font to QGuiApplication::setFont(), before loading any QML. Finally, the font is matched against Qt's font database to find the best match. ApplicationWindow propagates explicit font properties to child controls. If you change a specific property on the window's font, that property propagates to all child controls in the window, overriding any system defaults for that property. This property holds the window footer item. The footer item is positioned to the bottom, and resized to the width of the window. The default value is null. Note: Assigning a ToolBar, TabBar, or DialogButtonBox as a window footer automatically sets the respective ToolBar::position, TabBar::position, or DialogButtonBox::position property to Footer. See also menuBar, header, and Page::footer. This property holds the window header item. The header item is positioned at the top of the window, below the menu bar, and resized to the width of the window. The default value is null. Note: Assigning a ToolBar, TabBar, or DialogButtonBox as a window header automatically sets the respective ToolBar::position, TabBar::position, or DialogButtonBox::position property to Header. See also menuBar, footer, and Page::header. This property holds the locale of the window. The default locale depends on the system environment. You can set the default locale by calling QLocale::setDefault(), before loading any QML. ApplicationWindow propagates the locale to child controls. If you change the window's locale, that locale propagates to all child controls in the window, overriding the system default locale. See also Control::locale and LayoutMirroring. This property holds the window menu bar. The menu bar is positioned at the top of the window, above the header, and resized to the width of the window. The default value is null. See also header, footer, and MenuBar. This property holds the palette currently set for the window. The default palette depends on the system environment. QGuiApplication maintains a system/theme palette which serves as a default for all application windows. You can also set the default palette for windows by passing a custom palette to QGuiApplication::setPalette(), before loading any QML. ApplicationWindow propagates explicit palette properties to child controls. If you change a specific property on the window's palette, that property propagates to all child controls in the window, overriding any system defaults for that property. See also Control::palette, Popup::palette, and palette QML Basic Type. This attached property holds the control that currently has active focus, or null if there is no control with active focus. The property can be attached to any item. The value is null if the item is not in a window, or the window has no active focus. See also Window::activeFocusItem and Attached ApplicationWindow Properties. This attached property holds the window content item. The property can be attached to any item. The value is null if the item is not in an ApplicationWindow. See also Attached ApplicationWindow Properties. This attached property holds the window footer item. The property can be attached to any item. The value is null if the item is not in an ApplicationWindow, or the window has no footer item. This attached property holds the window header item. The property can be attached to any item. The value is null if the item is not in an ApplicationWindow, or the window has no header item. This attached property holds the window menu bar. The property can be attached to any item. The value is null if the item is not in an ApplicationWindow, or the window has no menu bar. This attached property holds the application window. The property can be attached to any item. The value is null if the item is not in an ApplicationWindow.